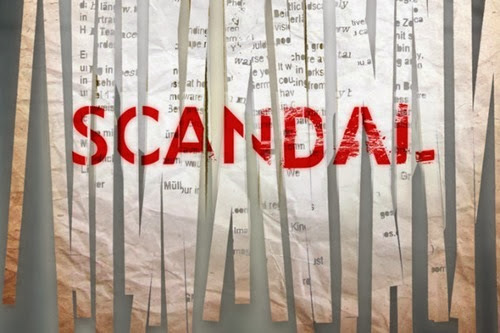 I have to admit that parts of this week’s Scandal had me bored. Parts were emotional and sad and parts were funny, but in general I think this served as a transitional episode. There were three story lines happening – one which was a conclusion of sorts to a previous story line and two of which were setting things up for future episodes. Olivia’s recovery: Olivia began the episode sitting on the floor of her apartment in her pajamas, drinking white wine instead of red, and holding her gun close. She told Cyrus she wasn’t back and wouldn’t help him prep Susan Ross for her Senate hearing. She had lots of flashbacks to her kidnapping and the aftermath. By the end of the episode, she was dressed, sitting on her couch, drinking red wine and eating popcorn, and had helped with two separate clients, the second being the Vice President candidate that she had previously refused to help. Her flashbacks at that point were about her relationships with Jake and Fitz rather than about the kidnapping. Olivia’s return to work came in the form of Rose, the woman who was looking for her and her neighbor Lois and who ultimately led Huck, Quinn, and Jake to figure out who had kidnapped Olivia. Lois had been killed and used as a decoy to sneak Olivia out of her building in a body bag. As it turned out, Rose and Lois were in love for many years and Rose had waited for her while Lois was married and raising a family with someone else. Olivia could relate to Rose’s sentiments about having to hide who she loved, as that is what she does with regards to her relationship with Fitz. Huck and Quinn recovered Lois’s body so that Rose could have closure, and Olivia told her that Lois had died of an aneurysm with no suffering. What will she learn from hearing Rose speak about the kind of relationship that she had with Lois? That remains to be seen. Susan Ross for VP: I found the Susan Ross parts of the episode rather funny actually. She is a likeable person who speaks what’s in her mind, with no thought as to how the people watching will perceive her. She worries about that later. When she snort-laughed in front of the world, she was later able to make fun of herself for doing so. Abby brought in Leo to help prep Susan for her Senate confirmation hearing and he was very hard on her, making her doubt her ability to actually do the job. However, she is smart and quick on her feet and with Olivia’s encouragement she is able to make it through her hearings and be sworn in as VP. Of course, Fitz also had to appear before Congress and apologize for his changing viewpoints on the war in West Angola before they were willing to accept his VP choice. 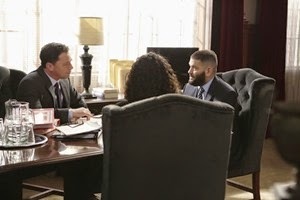 The issue of Fitz needing to apologize even brought Olivia to the Oval Office, where she stood in the background listening to Abby and Cyrus argue with Fitz until she finally spoke up and told him what he needed to do. The fact that she was there was interesting, because she said she wouldn’t go and she obviously wasn’t planning to speak at first. Mellie is excited that Susan is VP now because she doesn’t think Susan is a viable candidate for President and therefore won’t challenge Mellie in the next election. I honestly don’t understand why Mellie would want to be President when she sees what it has done to Fitz and to their family, and if he actually cares about her, why would Fitz support her to do so? One other thing I did find amusing was how short Susan is compared to Fitz. She hugs him after she is sworn in and she only comes up to his stomach! Who is Diego Munoz? 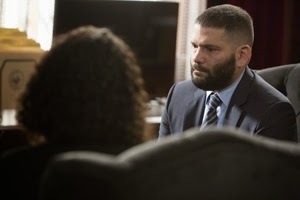 Approximately 2 hours before the episode aired I read a theory that Diego Munoz was Huck’s real name – and that theory was correct! His wife Kim had the files that proved the existence of the top secret spy agency known as B613 which tortured Huck and caused him to leave his family. Kim took the files to David Rosen, the Attorney General of the U.S., hoping to open a case against B613. Jake encourages Huck to lie and say none of it is true because of what will happen to all of them if the truth about B613 comes out. However, when faced with his wife and David Rosen, Huck admits it is all true and shares what he went through when he was kept in the hole. After hearing this, David commits to moving forward and bringing down the bad guys. The B613 plot doesn’t make a lot of sense to me, so I’m hoping for David to do his thing and get rid of it for good! Like I said, these previous two story lines are setting things up for things to come. My question is: If this week focused on Huck, next week is at least partially about Mellie, and the week after that is about Cyrus, when do we get an episode about Fitz? Tony Goldwyn is the best actor on the show and he is barely in any scenes! So frustrating!! If you watched, what did you think?